In 1886, after serving as acting librarian for three years, George William Harris was officially appointed Librarian of Cornell University. Born in Nova Scotia, Harris was a graduate of the Cornell Class of 1873. Under Harris’s administration, Cornell continued to expand its library. In 1885, Cornell acquired the Merritt King Library, some 4,060 volumes. This collection became the nucleus of the library for the new Law School, officially established in 1886. At the same time, Andrew Dickson White had also decided to present his personal library of more than thirty thousand volumes to the University, in exchange for a new fireproof building for the University Library. His impressive library included volumes on witchcraft, the Protestant Reformation, the French Revolution, and the Civil War. During this time, Cornell pioneered the use of electricity for lighting, both outdoors and indoors. By 1885, the library became one of the first in the country to be lit by electricity, allowing it to be open in the evenings. Library hours were now from 8 a.m. to 9:30 p.m. Meanwhile, the Cornell Library had outgrown its quarters in McGraw Hall. In 1892, the University Library (now Uris Library) was constructed to house the expanding collections. It was designed by Ithaca architect William Henry Miller, with a tower that has become the symbol of Cornell. The building itself was regarded as the finest college library in the country. The stacks were fireproof, and the building provided ample seminar and lecture rooms. It had space for 400,000 books. At the time, the Cornell collection included some 105,000 volumes. With the move into the new building, Harris created his own classification system. Based on the British Library system, it was a fixed location device, consisting of shelf numbers that followed a loose systematic arrangement by subject. 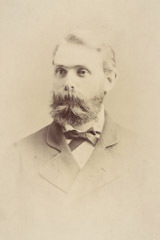 Harris also oversaw the creation of Cornell’s third unit library, with the establishment of the first state-supported college at Cornell, the New York State College of Veterinary Medicine, in 1894. Former Governor Roswell P. Flowers gave $5,000 for a library for the school in 1897, and four years later, his widow added a $10,000 endowment for the Flower Library in his memory. While serving as Librarian, Harris also edited the ten year book of 1888 (Cornell’s first alumni directory) and the library bulletin. he resigned his position as Cornell librarian in 1915.